Synthetic peptide corresponding to Human DC-SIGN aa 384-404. Our Abpromise guarantee covers the use of ab5715 in the following tested applications. WB Use a concentration of 1 - 2 µg/ml. 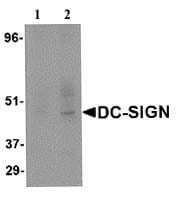 Detects a band of approximately 44 kDa.Can be blocked with Human DC-SIGN peptide (ab6091). Immunohistochemistry of DC-SIGN in human lymph node tissue with DC-SIGN antibody at 10 µg/ml. ab5715 at 0.5 µg /ml staining approximately 44kDa of human CD209 in Human placenta lysate by Western blot (ECL). 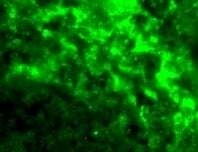 Immunofluorescence of DC-SIGN in Human Lymph Node cells using ab5715 at 20 ug/ml. Publishing research using ab5715? Please let us know so that we can cite the reference in this datasheet. Thank you for contacting Abcam regarding ab5715. I am sorry that you have been experiencing difficulties with this antibody in IHC. I have reviewed the protocol details you provided and I would like to get some additional information. 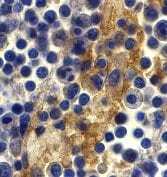 What type of sample are you staining (species and tissue type)? Also, did you try other dilutions of primary? If you are getting such high background, I would recommend using less antibody. How long are you incubating with the primary? Have you also tried a longer block? Less secondary antibody may also improve your results. Be sure to include a no primary control to confirm the background is not from the secondary. If possible, please include an image with your reply.